Crispy, hot Fried Wontons filled with pork and shrimp instantly take me back to my childhood, and the delicious homemade wontons my friend’s mother would bring over to our house. I don’t think I’ve ever eaten wontons at a Chinese restaurant – it’s always been a homemade treat, which makes them extra special to me. You’d think I would have made these wontons for the dumpling party our local San Diego food bloggers group held this past weekend. If only I’d had that forethought! 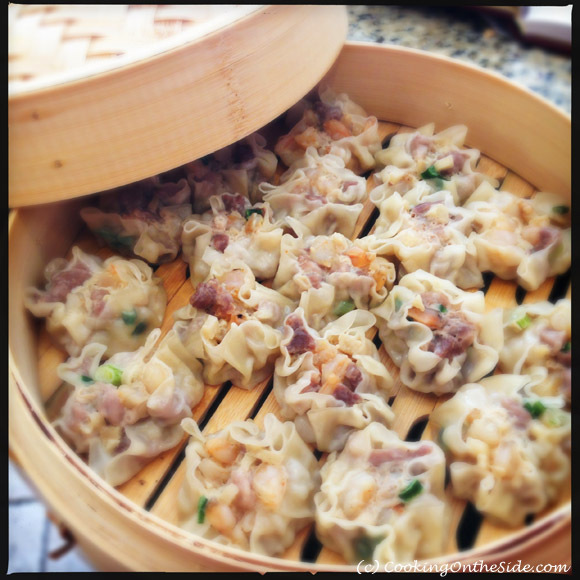 Instead, I made steamed siu mai, one of my all-time favorite dim sum orders. But then I turned over the package of wonton wrappers, as I tend to do with any product, and discovered a wonton recipe on the back that called for nearly the same exact ingredients. Of course, I realized this after I’d already made my siu mai filling…no big deal, I made siu mai for the party on Saturday, wontons for the family on Sunday! 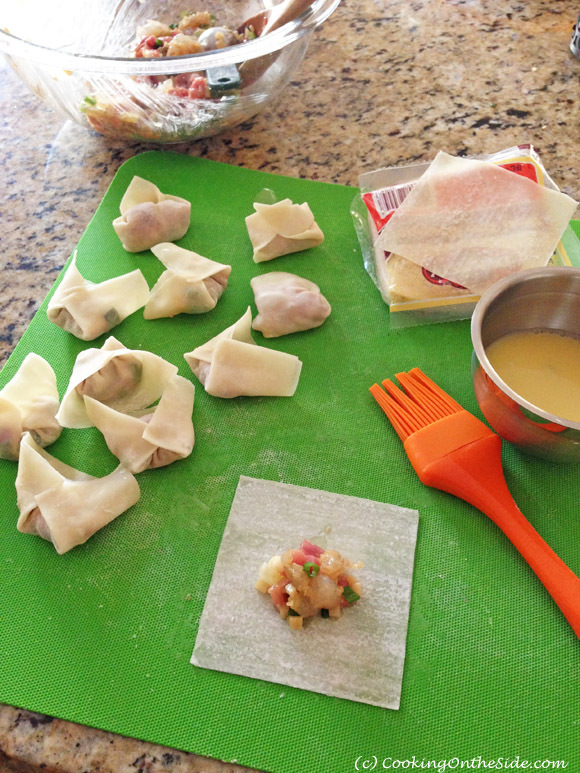 Here’s a look at what’s inside a wonton (I’ll be honest, I never really knew until I made them!). 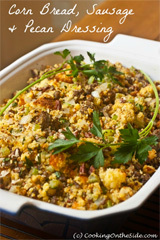 The ones I made had pork shoulder and shrimp, but you could always substitute beef, chicken or turkey if you prefer. Scallions and stir-fry sauce add flavor and water chestnuts bring texture. The cornstarch binds everything together. That’s it – pretty simple. After viewing this tutorial 4 or 5 times I felt confident enough to give it a go myself. I may not have gotten the nurse’s cap fold exactly “right”, but the good news is they taste the same no matter how you fold them…and even tastier dipped in sweet chili sauce (mmmm). Go ahead and give it a try! 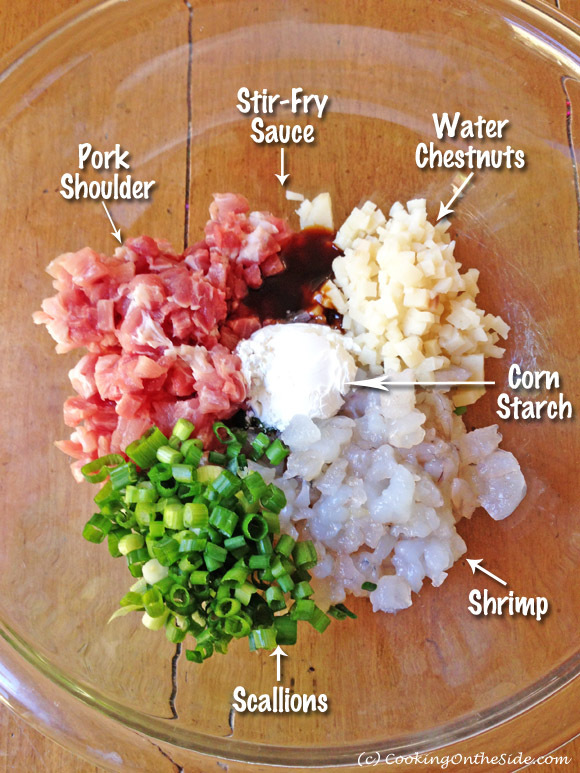 Combine pork, shrimp, green onions and tops, stir-fry sauce, cornstarch and water chestnuts; mix well. 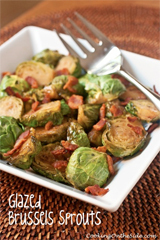 Deep-fry, a few at a time, in oil heated to 350° to 375°F about 2 minutes, or until golden brown. Remove from oil; drain briefly on paper towel. 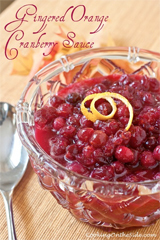 Serve warm with sweet chili sauce for dipping, as desired. * Cover any remaining water chestnuts with water. Refrigerate up to 1 week, changing water daily, and use as desired. I have been wanting to make crab rangoon for like forever. 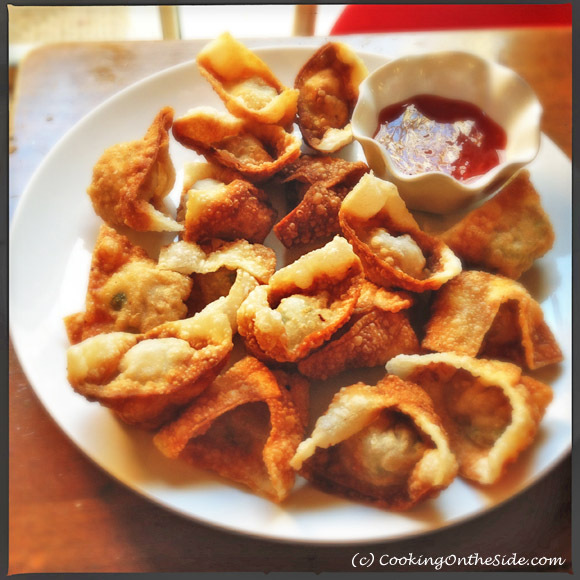 I’m a big fan of crab rangoon too – they’re next on my list! If only I didn’t use up all my wonton wrappers, lol. Just tried them! So easy to make! Hey KAthy, These are gorgeous and full of such great flavors! These look amazing, Kathy. I really wish I could eat them! Or that someone would invent a low carb, gluten free wonton wrapper! oh yes I LOVE fried won tons 🙂 these look yummy! 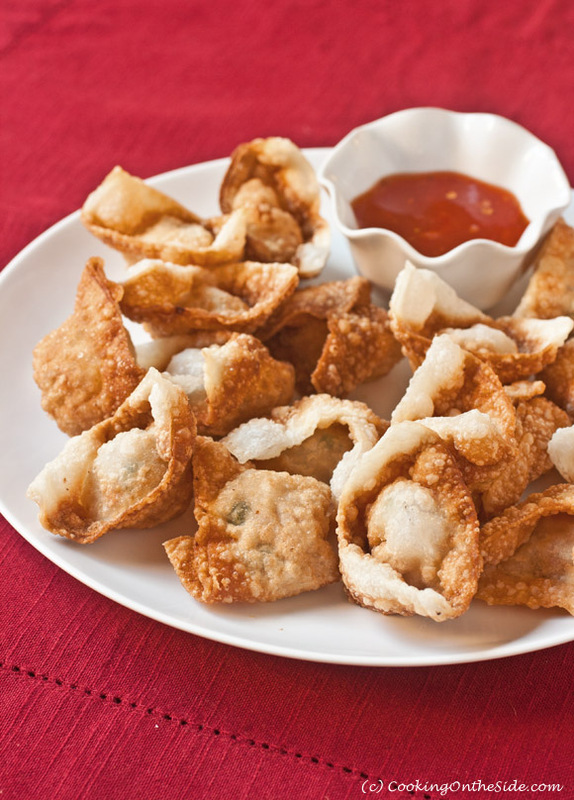 These remind me of the fried wontons my mom’s friend used to make when I was growing up – nostalgia!